So I had an issue with getting oil pressure, last monday I took the distributor out and the intermediate shaft out (which was very difficult-- warning sign!) and primed it with an electric drill, then put it all back together and fired it up. No oil pressure. This past friday once I had a few free moments, fired it up again and took the oil pressure plug out of the block to see if oil would come out, because it sounded and felt like oil has cycled through it. No pressure again. Rather than risk burning through all the assembly lube in a matter of seconds, I quit til today. I got the distributor out again today and pulled the oil pump off. If you find yourself in need of doing this, you have to unbolt the driver motor mount and jack the motor up a bit. So what had happened was the oil pump shaft had separated from the oiling gear inside the pump, and it was rotted and gunked and rusted up. The gear had seized and that's how the shaft worked itself free and led me on to believe I had pressure building up ala resistance on the drill. Well I ordered a new one (NAPA has everything for these cars) and filled the oil filter up and primed it and checked the valve covers for oil (should have done this to begin with) and fired it up, instant 55 pounds pressure. Long story short, always replace the oil pump. Just do it. If for whatever reason the pump gear had not separated from the shaft and finally worked itself loose when i had fired it up, it would have sent all that crap through the motor and fried the bearings, etc. and I would have been up sh!t creek. Last week i was cursing no oil pressure, today Im thankful it happened. I like it! Very nice. I just learned something too. I never knew that any C-bodies were ever used in NASCAR. The engine - I bored it 30 over and put new stock style flat tops back in it, new bearings on the stock rods, main, and cam. had the crank polished. put a new cam in it, it used the same springs and pushrods and works well with exhaust manifolds, i'ts a good cam kit, mopar performance made it, 268/284 duration and 450/458 lift, the same specs as the 383 HP magnum, I believe people call it the ''roadrunner'' cam. I kept the 516 heads since I wasnt going nuts with anything, had them cleaned, resurfaced and rebuilt, and had new exhaust valves put in it since the old ones were burned up, and had hardened unleaded seats installed. like I said with the cam, I have the stock cast exhaust manifolds, and 3 inch twice pipes with single chamber Flowmasters are going on it when the brakes are finished. It has the stock oiling system. I got a cast 4bbl intake from a 71 cuda with a 383magnum, #2951666, and put the classic holley 750cfm 3310 model on it with a 1 inch spacer under it, mechanical choke vacuum secondary. Ignition is a MSD Blaster 2 Coil and a Summit mopar distributor w/ vacuum advance plugged up to a Mopar Performance orange box. I will eventually get the Rev-n-ator box and save the MP as a back up, but the MP was 45 bucks and the Rev is something like 200. I broke it all in with a bottle of Cam Shield and Rotella T 15w40 diesel oil with additive, it has zinc in it, I was happy to have all I could get. I'll probably use that oil for a while. The motor makes around 330 horsepower, what it gets to the wheels, no idea. I eliminated the A/C and got the alternator bracket kit, got an aluminum stockish looking radiator, and plugged up the heater hose holes on the pump housing, everything else on the front of it is stock. essentially, I wanted to make a 383 magnum out of the old tired 2bbl plain jane factory build. Put a little pep in it's step without breaking the bank and spending a bunch of time. having an uncle that owns a great machine shop helped out a lot... eventually, when I am done with the car and done with a truck I am working on right now, I intend to do the Mopar Muscle 383 Magnum build, they took a stock 383 HP with stock 906 heads and got 450hp out of it with bolt ons- a single plane mopar aluminum intake, an 850 demon carb (Ill probably just use my 750), a Comp Cams 285/297 - 545/545 with lifters and springs, and a set of headers. They did it on an A or B body so the headers were easy, but I will get the Schumacher 65 C Body headers when I have that kind of scratch to throw away. If I keep my 516 heads then the 750 carb will make sense and I can hope for something in the 400 horsepower neighborhood, but Ill check the junk yards for a set of 906 or maybe even 915 heads if Im lucky, and have them cleaned and rebuilt. We will see when the time comes. Maybe do a Milodon oiling system. I figure it would be fun to slowly collect the parts and then do it in a weekend or two, while my friends sit around and joke on me while Im cursing and getting dirty. Thats half the fun of owning an old car, garage time! I did nothing to the transmission, aside from putting a new neoprene pan gasket and filter kit in it, the o-ring for the trans dipstick that leaks all the time, and making sure the bolts were tight and fixing any little leaks here and there. the 727 is bulletproof and I don't expect to have any problems, it was sparkling clean when I took the pan off. I'll cycle some new ATF in it when I get the brakes plumbed and see how it goes. I haven't done anything to the rear end either except new fluid, but it has a 2.76 right now and I plan to change that to a 3.23 or 3.55 at some point. 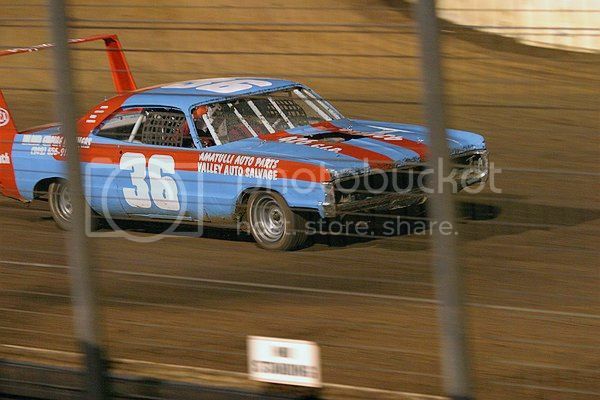 and here is independent Neil Castles in a car that looks like the car Buddy Baker had at the 1965 southern 500? Neil finished 8th in the grand national points standings and had 28 top ten finishes out of the 51 he raced in (55 races total that year)... if that was all in a C body thats pretty damn good. Cool, thank you for replying me. I got the exact same engine, trans and rear than you exept the cam, mine is a stock 4BBL one. My car is not finish yet so I want to know how does it run as is, with that rearend and all. With a few opinion I could make a choice, do I leave it like that or do I step up on cam and rearend. I know 2.76 gear is for highway but a friend of mine told me is father had a 1968 polara 383 4BBl and from 60 mph to top speed he hasn't been beat. He was racing on highway in the 80s, camaro, mustang, chevelle etc was no match cause they ran drag gears. Render time: 0.0629 sec, 0.0077 of that for queries. DB queries: 28.